It was inevitable. As soon as I opened my big mouth, volunteering to do daddy's "errand," I knew it was a mistake. "Great!" he said, "I need you to go to Les Schwab, have them patch up the tire with the nail in it, and get inner tubes on the tractor tires." Ok, I get the part about the nail (see here), but...um...inner tubes on tractor tires? Aren't inner tubes those things in which you slide down mountains or skim over water? "Um, ok?" was my tentative answer, "I don't know what exactly I should say when I get there." "I'll write you out a script," he rejoined, mock-rolling his eyes at me. "Yes. That would be good." And so, script in hand (really! ), and juggling the two front lawn mower tires, I found myself strolling into Les Schwab about twenty minutes later. Almost as soon as I entered the building, the tractor tires were whisked away from me, with the...uh...Les Schwab man (what do you call those guys? Store attendants? Waiters?) calling over his shoulder for me to "make sure that they get rung up." O...wait...that's not in my script - and you just stole the first part! 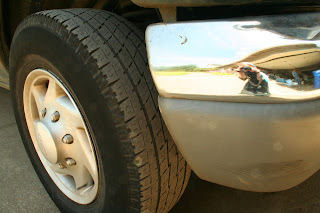 "Hi, I just brought two tractor tires in to get inner tubes put on, and I have my van out there that has a nail in the..." remember the script "...front-passenger-side-tire." Gracious, I hope that was right. "Ok, is the tire leaking air?" "Uh...." I assume so, why else would we need it fixed? Is this a trick question? What changes if I answer incorrectly?? "I think so. My dad just told me to bring it in and have it fixed." Great, now I sound like a totally clueless, ditzy girl. No secrets here. To his credit, the...LSG2 (Les Schwab Guy 2) didn't even chuckle at me. "Ok, great. So it's the green Ford van out there?" "Yes." Ok, that wasn't in the script, but I can go with it. "Do you know what year it is?" LSG2 queried, but even as he looked up at me, my dismay must have been painfully evident (I've always been told I have a terrible poker face), because he immediately grinned and answered his own question: "You probably don't, do you?" Year? I have to know the year of the car? I demand a new playwright! "Uh, no, sorry, I don't." Do you have the key?" "Yes!" thankful dad had reminded me to have the key ready, I handed it over and went to go sit down, breathing the smell of new tires. Have you ever noticed what a nice smell they have? I was fine until I was again called to the counter to pay for the services. "Fifteen dollars," LSG3 (but it could have been LSG1 - I don't know) informed me. Fifteen, huh? Daddy said it wouldn't be more that $50...I wonder if LSG3 is counting the mower tires, and the van tire. It would be better to find out now, I suppose. "Ok, is that counting the two mower tires I had fixed?" I asked, trying to sound like I new what I was talking about. "Yeah, I put them in the van - that's where they came from, right?" "Yes, well, and I had the tire fixed on the van too..." Why am I trying to convince this guy that I need to pay more? "Well," clears throat, "so I had the two things done, inner tubes on the tractor tires, and the nail fixed on the van." Finally, LSG3 understood what I was trying to say - which is good, because otherwise we would have been there all day - and, looking suddenly tired, and a cross between exasperated and amused, he explained, "We don't charge for fixing the van tire, because it's our tire." "Oh. Great!" Yeah yeah, I new that. Was that what dad mentioned about "free"? Finally convinced that the bill really was only fifteen dollars, I slid him my card, and got out of there before anything else could happen. So, maybe I have some things to learn in the car department. Like, can a nail be in a tire without leaking air? What year are the cars I drive (and why does it matter)? And, most importantly...what does one call a tire shop guy? Now, you've done that, Sweetie...and it likely won't be the last time! Funny story, Sarah! I can't tell you how many times I have been thankful for my Daddy when it comes to car-related issues. Sometimes you feel like "car people" speak an entirely different language. :) By the way, Happy Belated Birthday! I hope you had a most blessed and special day! :)Oh, and I love the new blog layout, too! I love that you carried a script! (-: And you are far ahead of me, because it sounds like you actually restrained yourself from calling your dad on your cell phone, which I know I always inevitably end up doing when I'm at Home Depot for him or some other equally foreign place!